Another swarm of locusts of Biblical scale, the third this year is destroying all crops grass and bushes in it's path in southern Russia. 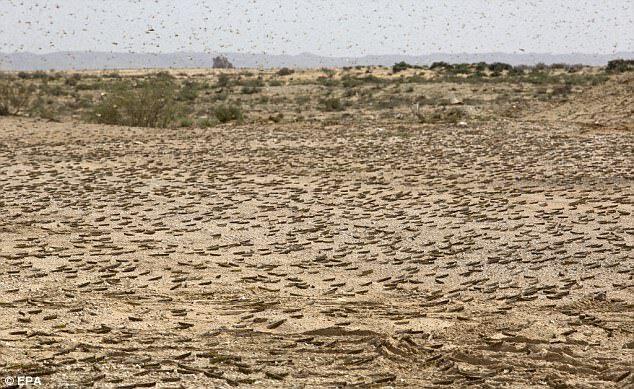 A swarm of locusts descended on southern Russian region of Dagestan, infesting at least 100,000 acres on Tuesday, prompting authorities to declare an emergency and take various measures to tackle the situation, including spraying pesticides from tractors and airplanes. The locusts are devouring all grass, bush and trees, and threatening local agriculture and cattle breeding as animals get no place to graze. Earlier in May, a state of emergency was declared in Greece battling a plague of locusts on a Biblical scale and in February, 80 percent of Bolivia's food crop came in danger by a massive plague of locusts that was decimating crops in the country's agricultural heartland.